I visited the Orlando Farmers Market in Lake Eola on a recent Sunday afternoon and bought lunch from Kenny & Denny's BBQ. Their menu consisted of turkey legs, sandwiches, quesadillas, and breakfast items. I ordered the BBQ Pulled Pork Quesadilla. 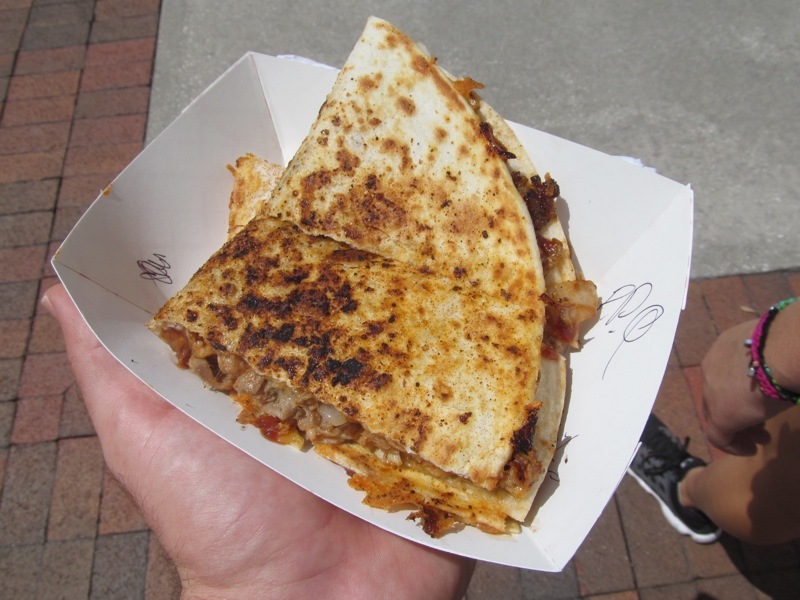 The quesadilla consisted of a tortilla filled with a generous portion of pulled pork, cheese, onions, and barbecue sauce. The whole thing was grilled until everything melted together, then was sliced and served. I did enjoy the combination of smoked meat, cheese, and barbeque sauce. The quesadilla was dripping grease while I was eating, probably a sign of how unhealthy it was. Still, the quesadilla was very tasty and I'd order this again at some point. I had lunch at Lime Fresh Mexican Grill in the Dr. Phillips/Restaurant Row neighborhood of Orlando. This Mexican chain has been in the area for a couple of years now, but I had not visited any of their locations until now. 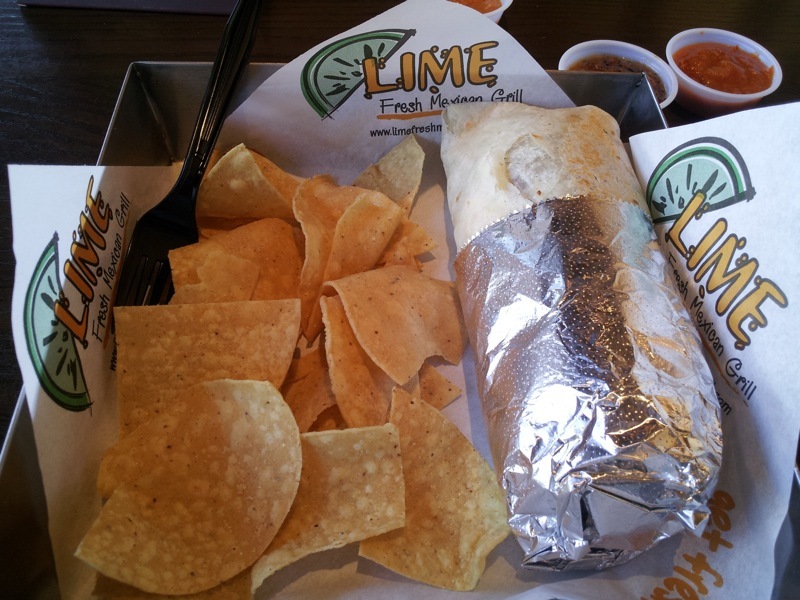 Unlike the other big burrito places, Lime had a set menu instead of the assembly line style of fast-food Mexican food that is done by Chipotle/Qdoba/Moe's. I ordered the Lime Burrito. This consisted of a tortilla filled with chicken, refried beans, cheese, sour cream, and lettuce. The burrito was alright, although a bit forgettable. Nothing really stood out and for some reason the refried beans reminded me of a Taco Bell burrito. Other burritos on the menu did have black beans, but not this particular one. Nothing is wrong with refried beans, but it did have the Taco Bell connotation. The chips served on the side seemed a bit too hard and somewhat stale. Overall, the food burrito I tried at Lime Fresh Mexican Grill was alright for what it was, but I don't think I'll go rushing back to try them again anytime soon. I visited with some relatives at the Polynesian Resort at Disney. While there, I decided to get a quick lunch from the hotel's main snack bar called Captain Cook's Snack Company. This quick-service restaurant mostly served sandwiches, salads, and flatbread pizzas alongside convenience store type items. I ordered the Hawaiian Flatbread and a Dole Whip. The flatbread consisted of a rectangular pizza topped with tomato sauce, cheese, pineapple, ham, and red onions. The flatbread was good sized, slightly larger than I was expecting it to be with the corners hanging off the plate. It was tasty enough, especially since it was from a hotel snack bar. The pineapple didn't make everything else soggy on the pizza which is always a good thing on a Hawaiian pizza. My biggest complaint here was with the rectangular crust not being utilized. The corners of the flatbread were completely free of sauce, cheese, or any other toppings. Otherwise this was a good flatbread. While in South Florida, I ordered take out from an Italian restaurant called Big Louie's Pizzeria in Pompano Beach. I ordered a medium Margherita Pizza. This pie was topped with tomato sauce, basil, and fresh mozzarella cheese. I probably should have ordered a normal cheese pie since I really couldn't detect what the $2 upcharge was for over a plain pizza. I suppose it was the fresh mozzarella, but nothing about the pie really stood out. Not to say this was a bad pie. It was actually a pretty good pizza (especially considering that this was cooked on a conveyor belt oven - normally a sign of mediocre pizza). I don't why, I just was expecting something a little different from a normal cheese pie when I ordered the Margherita. 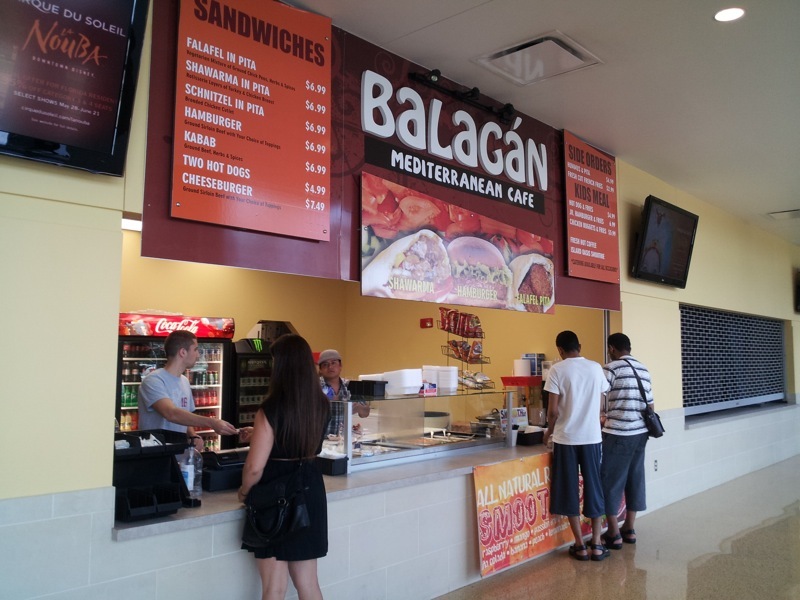 Today we're talking about Balagan Mediterranean Cafe in the UCF Arena. This Middle Eastern/Kosher restaurant is located on the first floor of the arena right inside of the main entrance. They have a menu that features falafel, shawarma, kababs, and standard arena snack bar fare like burgers and hot dogs. Their Middle Eastern foods are very tasty and the best part is the price. For the price of a bag of cinnamon nuts up a single flight of stairs at an official arena snack bar, you can get an entire sandwich at Balagan. I ordered the Schwarma pita. This was filled with turkey and chicken, lettuce, cabbage, onions, hummus, tahini, hot sauce, and whatever other toppings were available. I basically had them load up my schwarma with everything! 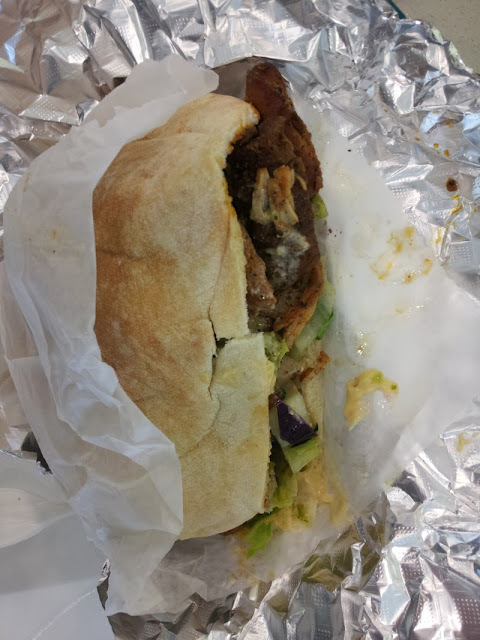 Although not the most photogenic sandwich, it was still very tasty. Way better than an overpriced hot dog or nachos from the snack bars right up stairs. I watched the fireworks at Lake Eola this year on July 4th. While there, I bought some ice cream from a truck called The Whip. They served ice cream where they would blend vanilla with a large selection of flavors to come up with over 40 different varieties. Shaved ice was also available, but I stuck with the ice cream. My flavor selection for the night was the blueberry cheesecake. 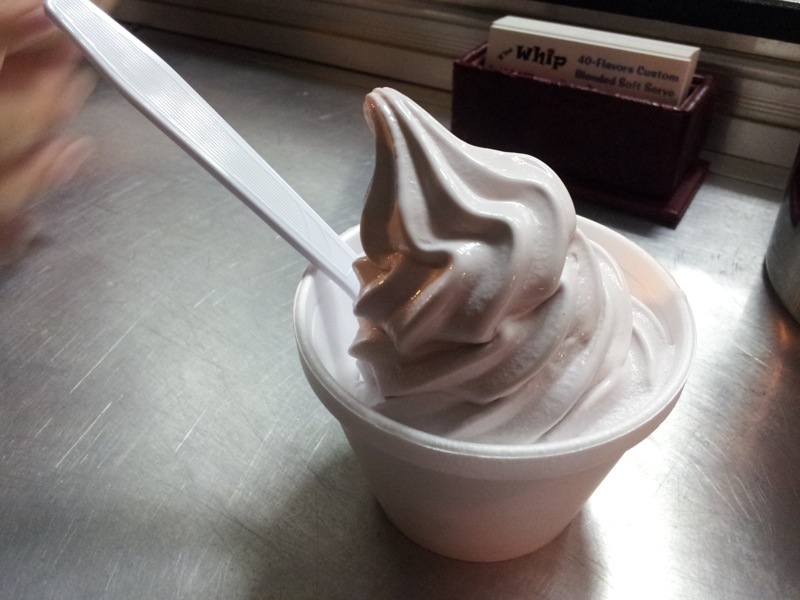 A cup of vanilla soft serve was filled and a container filled with the flavoring was removed from a freezer. Both were taken to a separate machine where they were blended together into a purple tinted ice cream. The flavor wasn't as strong as I've had elsewhere. I could taste a bit of berry flavor but didn't taste much cheesecake. Regardless, the ice cream was good enough and it was an interesting process to watch how they got all those flavors out of one soft serve machine. 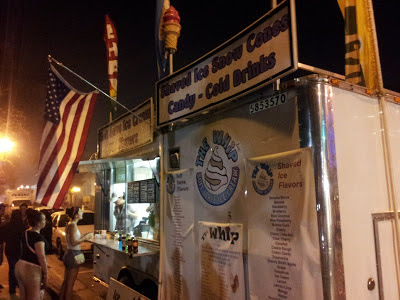 On the 4th of July, I ventured into Downtown Orlando and ate dinner at a restaurant called Harry Buffalo. This space was formerly occupied by a Cajun restaurant called Mojo, which I enjoyed on my first visit. The next two visits weren't nearly as good. I actually never got to try the food at Mojo on these visits. We were seated and sat for far too long without being acknowledged. Even after asking for our server, we were still ignored and ended up leaving on both of these subsequent visits. I know it's a different restaurant now, but because of the last two bad experiences at Mojo, I was hoping Harry Buffalo wouldn't have similar problems. This didn't click for some reason before dining at Harry Buffalo, but they do a lot of variations of Buffalo wings. With buffalo in the name, I don't why this wasn't obvious, but it didn't click for me. With that in mind, I ordered something that incorporated Buffalo chicken and had the Buffalo Mac & Cheese Big Horn Melt. It sounded like a weird and very unhealthy combination, but it was actually very tasty. The sandwich consisted of Buffalo chicken and macaroni & cheese sandwiched between Italian bread. The spicy buffalo sauce went really well with the cheesyness of the macaroni. Fries and coleslaw were served as sides. I liked my food at Harry Buffalo. They didn't have any of the problems that Mojo developed. They also had trivia going on which is always fun. I'd return! A while ago I visited Miami and tried the Pizza Rustica on Lincoln Road in South Beach. The pizza was pretty unique with huge slices with creative topping combinations. I was recently down there once again and passed by another Pizza Rustica location on Washington Ave and decided to give them another try. I had a slice of the Caprese Pizza. This rectangular slice was topped with tomatoes, basil, kalamata olives, and fresh mozzarella. While the toppings here could have had potential, the slice was overall disappointing. After being freshly reheated in the oven, this slice had a very soggy crust with no crispiness at all. The mozzarella was hardly melted and the other toppings didn't seem to adhere to the cheese like normally happens on pizza. They were just sitting on top and all fell off as I was eating the slice. I wasn't a fan of the pizza at this Pizza Rustica, nor was I a fan of the somewhat sketchy looking people loitering around the outdoor seating and the drug dealers. Stick with the Pizza Rustica on Lincoln Road.